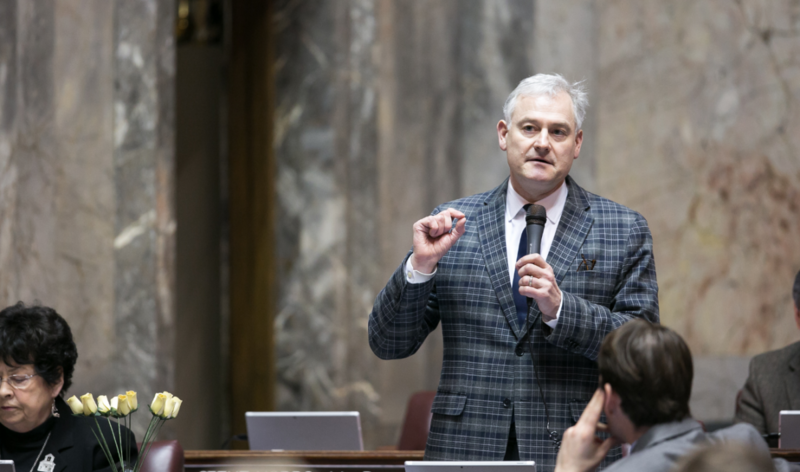 Washington State Senator Reuven Carlyle represents the 36th Legislative District, which covers several neighborhoods in Northwest Seattle. He chairs the Senate Environment, Energy & Technology Committee and serves on the Ways & Means and Rules committees. This session, Sen. Carlyle is sponsoring several environmental bills; so far, two of the bills on which Carlyle is the lead sponsor were requested by Gov. 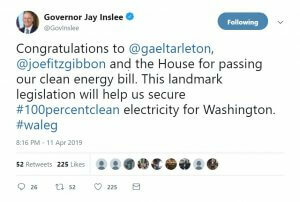 Inslee as part of his clean-energy plan. The Senate Environment, Energy & Technology Committee heard public testimony yesterday on one of those bills, which would begin Washington’s transition to 100 percent clean energy by 2045. Also yesterday, former California Gov. Jerry Brown met with Gov. Inslee and Democratic leadership, including Carlyle, to discuss climate change and legislation. 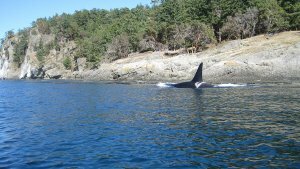 After a day full of talking about environmental policy, Carlyle paused for a brief conversation with Washington State Wire; we talked about his takeaways from the committee meeting (which you can watch via TVW here), what he learned from Brown, and what comes next. Sara Gentzler: Did you hear anything in public testimony today that you’d want to work with stakeholders on, in the context of the meeting you just had with former Gov. Brown? Reuven Carlyle: Absolutely. Look, we have taken California’s bill, Oregon’s bill. We’ve taken Hawaii’s bill. We’ve taken the best practices, the big, hot-shot academics. We’ve taken business and industry leaders. We’ve taken environmental advocates, social justice advocates, and we’re trying to really be thoughtful about putting it together in a very sensitive way to Washington’s interests. We are a trade state, we are a hydro state, we have a clean grid. We know that being incredibly sensitive and responsible to that measured transition is really important. So, to me, there’s a lot of very legitimate technical and operational issues that people surface that allow you to drill down. We’re really committed to this policy. I want it to be incredibly respectful of the subtlety and the uniqueness of different utilities: Clark County PUD is fundamentally different than Seattle City Light, and Puget Sound Energy is very different than Pacific Corps. We have to be appreciative of that. So we’ve got to be measured. We have enormous support to make meaningful action and we’re asking people to step up and come to the table with strong technical and operational suggestions to make it workable, but if they’re ideologically opposed to meaningful action on climate, then that’s a different story. SG: Does it feel substantially different, though, being part of a big majority? Does that process feel different with this power dynamic? RC: I think that it is clear that folks who have ideological opposition to action on climate have to make a choice. They can’t hide anymore. We’re going to move this bold legislation. And, you know, truthfully, California has done this years ago. Oregon is doing it. Hawaii has done it. Other states have done this. This is not frighteningly scary, this is measured but meaningful reduction in carbon emissions. And I think the people of Washington are pretty damn supportive of that concept. So we’re not being dramatic, we’re not being extreme. We are taking the best practices from the West Coast, being smart about them, and applying them to Washington State. And [the majority], it forces people to get serious about coming to the table and saying “Look, here are the legitimate objections that the previous world used rhetorically and just said ‘We’re opposed.’” And they can’t do that anymore, because we’re going to pass legislation. SG: Did you get anything out of your meeting with Governor Brown that you will apply going forward? RC: He was really focused on the real-deal political policy dynamics — which policies can gain support. You know, their cap-and-trade proposal had enormous support from Republicans, as he talked about. The 100 percent renewable is absolutely achievable. And people, once they step back from the fear that it’s going to raise rates, actually realize that the value of the investment is pretty substantive. You have Microsoft in our state, which purchased the ability to get off of fossil fuels and off of coal, to be able to sell it in their data centers to their industrial companies. You know, Amazon has a global strategy for being less of a carbon footprint, and they’re a delivery organization. And the fact is that Starbucks has been a serious leader; they buy coffee beans from 382,000 coffee farmers around the world, 97.5 percent of those farmers are small-lot family farms. Climate change is dramatically impacting that industry. My point is that every element of our society, of our culture, our companies — Bill Gates, the Vulcan and the Paul Allen organizations — every one of the thought leaders that we admire in this state is a leader on climate. And for us as a state, it is simply time to match that level of passion at the policy level.